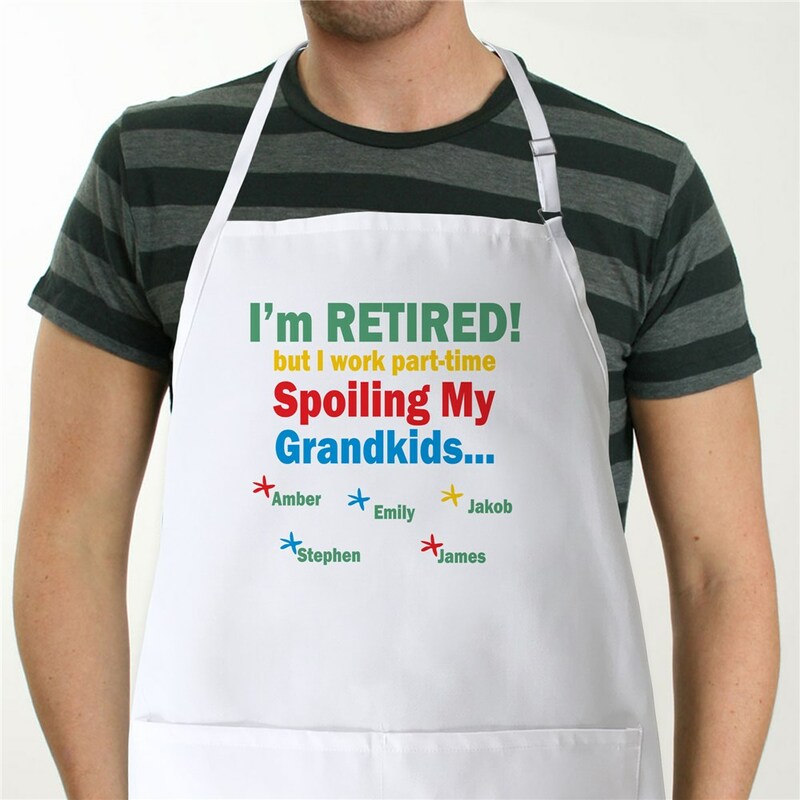 Enjoy every moment you have with your grandchildren and spoil them rotten in our Personalized Aprons. Cooking goodies and treats with your grandchildren will create wonderful memories for you and them. Our Personalized Chef Apron will keep your clothes clean while lovingly preparing all of their favorite foods. Our Personalized Grandma Apron is a full length, 65/35 cotton/polyester twill fabric apron with matching fabric ties. Machine washable. This custom bib apron measures 20" Wide x 30" Tall and features multiple pockets for convenient storage along with an adjustable neck strap for a comfortable fit. Includes FREE Personalization. Each Personalized Grandma Apron can be personalized with any title and up to 30 names. I will give this to my husband on the 20th. Since it is designed just for him, I hope he will use it!! Our Personalized Aprons are great for Birthdays, BBQ's, Fourth of July, Mother's Day, Valentine's Day, Grandparents Day & Christmas. We are your number 1 creator of Personalized, Custom & Novelty Aprons. Grandma, Mom, Granny, Mommy & Aunt will love their very own Personalized Apron from GiftsForYouNow.com.